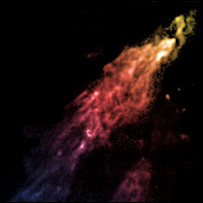 Dubbed "Smith's Cloud", it may set off spectacular fireworks when it smacks into our galaxy in 20-40 million years. It contains enough hydrogen to produce a million stars like our Sun, researchers believe. When it does fully interact with our galaxy, the cloud could indeed set off a new burst of star formation in the Milky Way. Details of the work, by a team at the US National Radio Astronomy Observatory and the University of Wisconsin-Whitewater, were unveiled at the 211th meeting of the American Astronomical Society in Austin, Texas. Smith's Cloud is named after the astronomer who discovered it in 1963. But until now, astronomers had no idea whether it was leaving the Milky Way or falling into it. The new work, which used the Green Bank telescope (GBT) in West Virginia to observe the object, shows, unmistakably, that the latter is true. The team's new measurements also demonstrate that the cloud is 11,000 light-years long and 2,500 light-years wide. The monster cosmic "fog bank" is careering towards our galaxy at more than 240km/s (150 miles/s) and is set to strike the Milky Way at an angle of 45 degrees. Broadly speaking, the cloud is currently rotating with our galaxy, but is also moving in towards it. Astronomers can see a wall of gas being ploughed up as Smith's Cloud thuds into the outskirts of our galaxy's atmosphere. Lead author Dr Felix Lockman, from the NRAO, said the object, which lies at a distance of 40,000 light-years from Earth, would make an impressive sight if it could be seen with the naked eye. "We don't know quite where it came from yet, as its orbit is a little confused, but we can tell it is beginning to interact with the outskirts of the Milky Way, that it is suffering drag and that bits of it are falling off," he told the BBC News website. "But at the same time, it is feeling the gravitational pull of the Milky Way and is plunging in towards the disc." By the time it merges with our galaxy, Smith's cloud will strike a region some distance from the location of our Solar System, about 90 degrees ahead of us in the disc of the Milky Way. Where it does collide, the cloud will generate shockwaves in the gas already residing in the Milky Way. "It will be just like letting a bomb go off," said Dr Lockman, "but you also create a lot of new gas which may have different properties to the existing gas. The shockwaves will set off a tremendous burst of star formation. These stars will be massive, rushing through their lives quickly and exploding as supernova. "Over a few million years, it'll look like a celestial New Year's celebration, with huge firecrackers going off in that region of the galaxy," said Dr Lockman. Co-author Dr Robert Benjamin, from the University of Wisconsin-Whitewater, told BBC News: "If the drag is sufficient, and the cloud fragments, there could be less of an effect. But at the moment, it looks like it is holding together quite tightly." Astronomers had previously surmised that a region of bright stars called Gould's Belt, which lies close to our own Sun, could have been created in just this way. "This is the first time we're actually seeing it happen," said Dr Lockman. 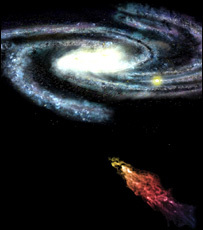 "The Milky Way is still under bombardment - there are still fragments of it coming in and arriving on the scene. When this happens, it can bring fresh gas and trigger new star formation. And it's interesting to speculate whether this [once] happened near the Sun." The gas cloud was discovered in 1963 by the young American astronomer Gail Smith working at Leiden University in the Netherlands. She subsequently left science but still lives in the Netherlands.